Sigh...I've really enjoyed fawning over the DC Comics promo's coming out of Hong Kong, and has yet to come (2+ more burgers) has really made me jealous. About 3 weeks ago Singapore re-released the Ebi Burger, the same shrimp burger I reviewed last year around this time. This coming after nearly 2 months of rehashed Samurai Burgers, I wasn't very happy, since the last truly new promo burgers in Singapore came out in August. Although it's not really totally new, yesterday they introduced a new variant of the Ebi Burger, the Wasabi Ebi Burger, and since it was my birthday, I thought I'd treat myself to a burger I'd normally skip. Go back and read the original burger review, as there's more background about other Shrimp burgers I've had before. In 2013 McDonald's Singapore released Filet-o-Fish sandwiches with new sauces, Thousand Island and Tangy Sesame and earlier this year they tried again with "Tangy" and Nacho Cheese, which actually stuck around as a regular menu item. 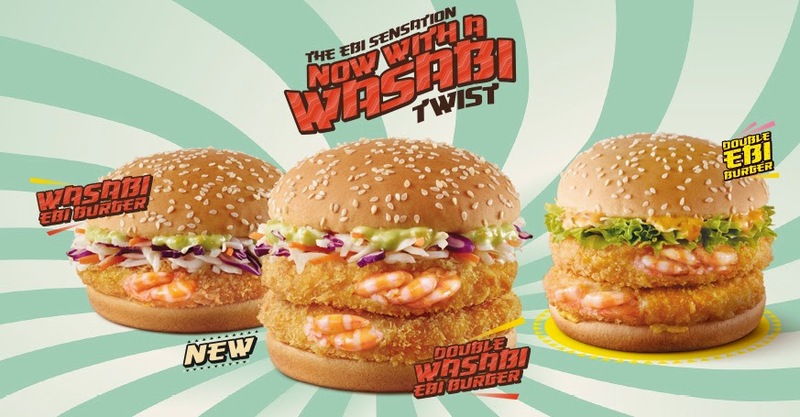 I just hope they don't try yet another flavour with the Ebi Burger, it's finally time for something new! The Ebi Burger included the same whole-shrimp patty that I quite enjoyed last year. The shrimp were still surprisingly large, and they used the same decent carrot/cabbage veg mix which is appearing on burgers more and more in Singapore. But the naturally, the biggest change was the Wasabi sauce. The Wasabi sauce was stronger than I had anticipated. It wasn't knock-your-socks-off nose-burning hot, but it was clearly Wasabi flavoured. Where McDonald's Singapore 'spicy' burgers usually could be eaten by even those with zero spice tolerance, this burger could not be eaten by those that do not like wasabi, because that pungent wasabi taste is indeed there. Yes, the wasabi sauce was decent, but it wasn't great. I've had wasabi sauce on other fish burgers before, and I felt that it does usually work well, although it wasn't a great combination with the shrimp patty. The shrimp patty has a nice flavour on it's own, and I felt the original Thousand Island + Mustard combination just worked better. This sauce actually took away from that flavour, and hid any taste the shrimps may have had. If you aren't in Singapore, the Shrimp Burger, which used to be a regular menu item in Korea (albeit with a minced shrimp patty), is making a brief return as the "Deluxe Shrimp Burger" which is now the same whole-shrimp patty used here in Singapore, but also served with a slice of cheese. That new Pink Lemonade drink is new as well. There were a couple new sides here in Singapore as well, and I'll be reviewing those next. Stay tuned! The burgers may be the same, but at least in Korea they don't have to deal with the terrible adverts they run in Singapore. Which do you prefer? Happy Birthday from me and Miss Milkshake! Loved the review as ever!